A bill currently approved by the General Assembly could strip Richmond of millions of dollars in federal funding for transportation and air quality improvement if it is signed into law by the governor. House Bill 2269, introduced by Republican Del. Charles Poindexter of Franklin County, prohibits the state from participating in the Transportation and Climate Initiative and “any other regional transportation sector emissions program.” Richmond officials are worried the bill is so broadly worded that it could affect existing programs like the Congestion Mitigation and Air Quality Improvement (CMAQ) Program. Richmond has received more than $34 million in transit funding from the program over the last decade. 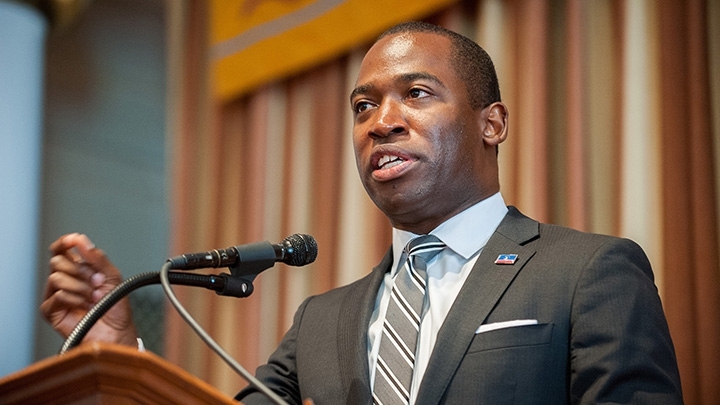 In a letter sent to Northam last week, Mayor Levar Stoney urged the governor to veto the bill. Stoney said its passage would have an immediate impact not only in Richmond, but across the state. “This would put $60 million in CMAQ funding at risk, and with it, allocated funding for some very important projects to the Richmond region,” he wrote. According to Stoney’s letter, the CMAQ program has partially funded Richmond’s bike share program, bus stop improvements and operations at Main Street Station. The CMAQ program was established in 1991 to provide federal funding to localities that do not meet national air quality standards. At the time, that included some parts of the Richmond region. Even though air quality has improved, Richmond continues to receive federal funds for new pollution controls, including expanding public transportation. Robert Steidel, the city's Deputy Chief Administration Officer of Operations, told Richmond City Council on Monday night that the city receives an average of $3.7 million through the CMAQ program each year. Poindexter’s bill is primarily aimed at reversing Northam’s decision in September to join the Transportation and Climate Initiative. The program includes a group of nine northeast states and aims to reduce transportation-related carbon emissions. Some of the group’s goals include promoting the expansion of electric vehicle infrastructure and creating a regional cap-and-trade policy by the end of the year. Virginia Senator Mark Obenshain, R-Rockingham, compared the Transportation and Climate Initiative to the 'Green New Deal' proposal from congressional Democrats when voting in favor of the bill. “If this is a step in the direction of preventing Virginia from joining some crazy, looney idea like banning airplanes, I’m all for it,” Obenshain said. The Transportation and Climate Initiative has not proposed banning any specific mode of transit. The broad prohibition on regional transportation emissions programs was also criticized by a number of Democratic lawmakers in Virginia. When the bill was being debated on the Senate floor earlier this month, Chap Petersen, D-Fairfax, said he was concerned that counties in Northern Virginia would be stripped of funding. Those counties has struggled for decades to meet emissions standards. “If you read this [bill] strictly...we would not be able to participate in the very programs that try and limit air pollution currently in our community,” he said. Northam has so far not taken any action on the bill. He has until March 26 to veto it or sign it into law. You can read Stoney's full letter to Northam here.